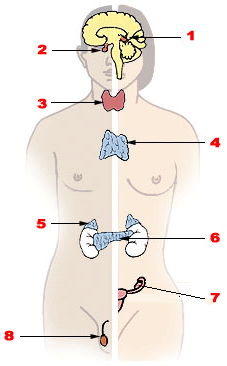 ^ "Diagnosing Hyperthyroidism: Overactivity of the Thyroid Gland". endocrineweb. ^ Savage, M W; P Mah; A Weetman; J Newell-Price (1 September 2004). "Endocrine emergencies". Postgraduate Medical Journal. 80 (947): 506–515. doi:10.1136/pgmj.2003.013474. PMC 1743094. PMID 15356351. ^ Brouwers, FM; Eisenhofer, G; Lenders, JW; Pacak, K (December 2006). "Emergencies caused by pheochromocytoma, neuroblastoma, or ganglioneuroma". Endocrinology and Metabolism Clinics of North America. 35 (4): 699–724, viii. doi:10.1016/j.ecl.2006.09.014. PMID 17127142. ^ Tahim, AS; Saunders, J; Sinha, P (2010). "A parathyroid adenoma: benign disease presenting with hyperparathyroid crisis". Case Reports in Medicine. 2010: 1–4. doi:10.1155/2010/596185. PMC 3014839. PMID 21209735. ^ Newell, KA; Prinz, RA; Pickleman, J; Braithwaite, S; Brooks, M; Karson, TH; Glisson, S (August 1988). "Pheochromocytoma multisystem crisis. A surgical emergency". Archives of Surgery. 123 (8): 956–9. doi:10.1001/archsurg.1988.01400320042007. PMID 2899426. ^ Scholten, A.; Cisco, R. M.; Vriens, M. R.; Cohen, J. K.; Mitmaker, E. J.; Liu, C.; Tyrrell, J. B.; Shen, W. T.; Duh, Q.-Y. (2 January 2013). "Pheochromocytoma Crisis Is Not a Surgical Emergency". Journal of Clinical Endocrinology & Metabolism. 98 (2): 581–591. doi:10.1210/jc.2012-3020. PMID 23284003. ^ Phitayakorn, R; McHenry, CR (June 2008). "Hyperparathyroid crisis: use of bisphosphonates as a bridge to parathyroidectomy". Journal of the American College of Surgeons. 206 (3): 1106–15. doi:10.1016/j.jamcollsurg.2007.11.010. PMID 18501807. This page was last edited on 18 December 2018, at 00:09 (UTC).